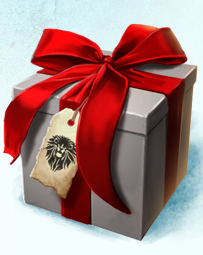 Will Black Lion Chests Feature During Wintersday? What I'm curious about is whether this new image of a chest is a new item (like the Lost Shores chests) or whether it'll be the existing Black Lion Chests. My current theory is that Arenanet are working two kinds of events, two categories. First there are the holiday themed events - Halloween and now Wintersday. Then there's the "world changing" events - which so far we've only seen one of: the lost shores. It may be that they'll only release new types of chest for the world changing events and leave the black lion chest and key system in for the holiday events. I can't say whether this is more logical than an alternative or whether it's correct or not. But I guess, as we've talked about many times, it's not what will actually happen during an event that matters, it's the strength of the speculation before hand. Watch out for Black Lion Chests. If they reach something like 30 copper each I'll not be surprised (but I might raise an eyebrow). It's hard to predict with a so small past history of the game :/ Your thinking could be right...but it could even be true that, after many complains i've seen on forum, they ll choose to create an "alternative" package like the lost shores one... wich have a much higher chance to drop a weapon etc (almost all ppl that opened them found something...while for halloween some didn't find anything even after 100 euros of keys :S. This way BC chests will kinda lose meaning...unless you desperatedly want that perma trader/bank etc...who knows ! we ll see. I totally agree that it's early in GW2s life cycle so who knows what way they'll go. But I'm watching chests with interest anyway! they're around 10-12 atm, I hope they get higher, I have about 500 so I could be able to make a little profit out of them ! We'll see if they put some alternate chest on the gem shop as you just said. If glacial lonestone spike to 70-80s, then cores will go to 20-25s. You can make so much more profit with cores. 2 cores + wine + crystal = 1 lodestone. Cores are currently at 6.6s, lonestones at 51.50s. The wine is at 25.6s. Crystals are bought with skill points. If lonestones were to go up to 80s (55% profit), core could go up to 27.2s, a crazy 300% profit (no TP fees calculated). That's the reason I bought 100 cores and no lonestones. Well we have seen in the past that arenanet likes to try and "fix" the market on items that have crazy supply stacked up in the trading post and have little value due to it. So following that trend I would not be surprised if they did something with the black lion chests since the are/where next to worthless. I surely hope they will be used for events. There are several hundred thousands of them idling around on peoples accounts. If they've stopped using them for events they will practically be worthless - since keys are rare and gem shop keys aren't *that* cheap. Hmm on that same note I am starting to lean towards Silver ore being used in the toy making. As its the most worthless and over supplied ore i can see them wanting to fix that market.